Another view of HMS Natal which sunk in the Cromarty firth in 1915. My grandfather - Peter "Pete" Penfold was on that ship when it blew up. According to my mother and my aunt just before it blew up, he knew something was going wrong, and he dove overboard and swam three miles to shore, and survived the frigid waters, and the explosion. My Father - Malcolm Mc Burnie was on deck when the Natal exploded and was blown into the water. According to his story, he spent 3 hours in the water before being picked up and also 3 weeks in hospital at Scapa Flow. We came to Canada in 1927 when I was 2 years old. Robert Mc Burnie, Oshawa, Ontario, Canada. 22 April 2004. After the sinking, few of the ordinary seamen were interviewed in detail, but all were asked where they were at the time of the explosions in case they might have useful information. According to the records, Private A Penfold (RMLI) was in the lamp room, port side forward, and Ordinary Seaman McBurnie was in the forward shell room. They were lucky to be in the forward part of the ship as the explosions originated in the aft, where a section about 40 feet long blew apart from top to bottom of the ship. Mr. Dane, Could you supply a photograph of the Natal medal you refer to, and post it to this site? I haven't heard of this Medal before, kindly show both sides. Dear Mr Watson - sorry cannot take photo but can tell you one side has picture of HMS Natal 1915 on the other side is "From the people of Natal" with an engraving of 2 running Antelope. Cromarty Courthouse has loaned Invergordon Museum two HMS Natal badges for the new exhibition. One is the circular silver medallion struck for every crew member with money donated by the people of Natal. The other is a beautiful little coloured enamel badge with the same emblem of running horses and "HMS Natal Grand Fleet 1915" at the bottom. I have never seen this one before. Does anyone know anything about it? Mr Dane's medal sounds like the circular one I mentioned above. I can post pictures of it if anyone is interested. In view of the comment about antelope, I've just checked what the emblem is and we're both wrong - it's wildebeest! I would like to know if anyone has any details of who received the Natal medal, was it given to the whole crew or only to the survivors ? The circular medallion was issued to every member of crew in summer 1915. Money had been donated by the people of Natal for comforts for the crew, and this was how quite a large part of it was spent. As you might imagine, there was a certain amount of debate over whether this was the best use for the money! Thank you for your comments, may I ask what your interest in this vessel is, did you have a member of your family onboard her ? No family connection - I am working on the exhibition for Invergordon Museum. I have checked to see what information I have on your grandfather, who is listed as Leading Stoker WF or WT Dane. At the time of the incident he was in the forward CO2 room, which meant that he was lucky enough to be well away from the site of the explosions. Thank you very much for that information, his name was William and I have the medallion. He was my grandfather _ I would very much like to see the exhibition but I doubt I will. Please give me any other details you have of him or his ship-mates. This site took me back many years ago to about 1961 when I read "They called it Accident" by A Cecil Hampshire that my library in Sheffield had in stock and I have retained an interest in warships of this period since. 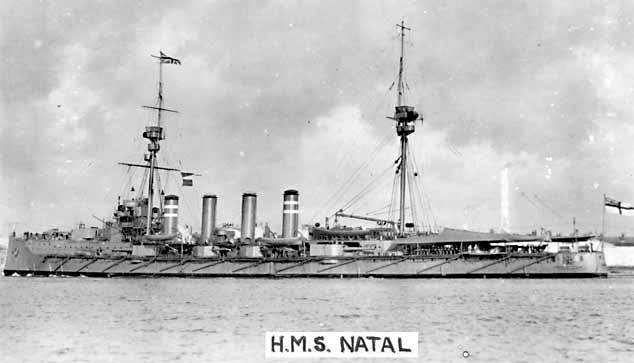 Natal was a crack ship and was gunnery champion of the fleet before the war. The class of four were successful but unlucky. Warrior was lost at Jutland, Cochrane wrecked and only Achilles survived. They were said to be made obsolete by the battlecruisers built in 1908 but they were still powerful vessels. The book was interesting to a 10-year old, especially a story concerning some poor sailors said to be trapped behind bars in the ships cells! If anyone is interested they can search Amazon who can locate copies. Unfortunately the destruction of NATAL was not unique and many other warships were lost around the world during this period and with due respect to NATAL more "important " ships could have been sunk by any "conspiritors" having access to the magazines of HM's warships. Nice photographs of a great warship and still a great story. My Grandfather Frank Stone was on the Natal the night she blew up and there were two explosions cos he heard one and started back for his wallet and then there was another and he went over the side. He survived to go on to be a Lt Comander in the second world war and commanded a flower class corvette. I have been researching my family history for a few years. I was talking to my mother only this Saturday and she said that she had a feeling her Great grandfather was killed during WWI. I was aware he worked on the Chatham docks as a skilled woker on the Gun Whaft. Checking birth and marraige certificates of his children I could see he died between 1911 and 1917. I checked the Commonwealth war Graves Commisson website and there he was, Arthur Vince aged 53 H M Gun Wharf, Chatham HMS Natal 30/12/1915. I have tracked a copy of the book "They called it Accident". Do anyone else know of Arthurs name being mentioned anywhere? to Estelle Quick do you have any idea from the records where my grandfather Frank Stone was at the time of the explosion and as a survivor of the explosion would he have got an HMS Natal medal. By the way thank you everyone for the info on this site. After reading it I managed to get a copy of "They called it accident" from www.abebooks.com for £14.95 from a bookshop in Malborough but there were several other copies for sale on there. Looking through the history of comments on the Natal explosion I see some crew members were in the forward magazines. It was and I assume is, custom and practice for work parties not to have anything combustable about their persons on pain of severe punishment. Felt boots were even worn in the magazines so that no sparks could be given off. When the ship first detonated a working party in a forward magazine were plunged into darkness and became disorientated. They were saved by one individual striking a match he remembered, they found the ladder, opened the hatch and made their escape. I doubt if he was prosecuted as a result or perhaps told the story many years later! It was not uncommon when magazines exploded that a chain reaction occured detonating each magazine in turn until the whole ship disintigrated. The casualty figures in Natal were heavy but she sank after several minutes rather than instantly as in Bulwark and Vanguard. To Steve Challice - naval officers interviewed all the survivors who were on board when the ship sank and noted their whereabouts in case they had useful evidence for the court of enquiry. These notes are in the admiralty records, of which there is a copy at Invergordon Museum. P.s. Steve I forgot to add that I will have a look for references to your grandfather next time I am at the museum. The hms Natal medallions were given to all crew members in summer 1915. Hi Estelle I wonder if you can help? My grandfather survived the explosion of the HMS Natal - he was in the water for nearly an hour and was picked up by two fisherman. My father is researching his history and we would dearly love to have any photos or evidence you may have. Please let us know when the exhibition is ready as I would like to take my father to see it. My grandfather's name was Edward Stupple and we think his rank was a Torpedoman. Hello Alfred. The exhibition at Invergordon Museum opened last December. The museum is now closed for the winter and will reopen in May, but let me know if you would like to get in before then. Most of my notes are at the museum and I will have to go and dig them out to see if there is any detail on your grandfather. I have a copy of the list of survivors here at home - he is listed as a Gunner. Hi Estelle, I am so pleased to have come across this website. My Nan who was an orphan from Bootle, Liverpool lost her only brother Jack Martindale a musician on HMS Natal. I have his medal and the letter from the King framed in pride of place on my wall at home along with a picture he painted before his death. If you do have any information about him I would be delighted to hear from you. I have tried to locate a copy of the book mentioned but it would appear to be out of print so if anybody had a spare copy it would be good to hear from them. Dear Alfred and Martin, I have been over to Invergordon Museum and had a look through the Natal files. Edward Stupple was on the main top mess deck when the explosions happened. He was fortunate because the messes were between the gun redoubts on the main deck, and this area was protected by extra thick armour plating as well as being well forward of the magazines which blew up. There would also have been relatively easy access to the upper deck to get off the ship. I couldn't find anything else specific on what happened to Edward - he was not among the few crew members called to give evidence at the court martial. Bandsman Martindale RMB1514 (PO) is listed as Jonathon. Is this his right first name? I can't tell you anything about what happened to him, other than to say that the bandmaster, bandcorporal and 13 bandsmen were killed, and I believe that this was most if not all of the Royal Marines Band. I have photos of one or two of them but not Bandsman Martindale. Sadly he was one of the many whose bodies were never recovered. Thanks for the information Estelle, yes it would have been Jonathon he was known as Jack to my Dad. If you do have the photos I would love to have a copy of them. Thanks so much. An addition to my cousin Derek Dyer's comments on 02/01/04. Further information from our Aunt. Arthur William Penfold (nickname 'Peter') was a Royal Marine on HMS Natal at the time it sank. He joined the Royal Marines at Deal(under age by 283 days) on the 4th Jan 1902. Register number 13040 Company A. Then he qualified as a Lamptrimmer in 1907 and was apparently 'trimming' on the upper deck when the explosion occurred. Hence when the ship rolled over he was able to swim to shore (he passed a swimming test at Deal on 21st Feb 1902!!). Apparently the day before he had been ashore drinking with a group of shipmates and had returned on the last duty boat. The others had however stayed behind to continue drinking and to suffer 'defaulters' charges for returning late. He saw them arrested on their return to the ship and sent to the brig where they still were when the ship rolled over. I have my grandfathers parchment service record and it shows he joined HMS Natal on 17/09/1912 and 'discharged' on 31/01/1915. He died in 1947. His son (my father) was born in 1919 and served in the Royal marines in WWII. It is ironic to think that had my grandfather continued drinking with his friends, this arm of the family would not exist, particularly when he died of drink related problems! I'm reseaching my family tree and have found out that my mum's uncle Joseph Hart was on this ship. My mum would love a book of photos of the boat and crew etc. Does anyone know if there is such a book? My grandmother Ettie Camelia married Stoker 1st Class ARCHIBALD STONE, of the HMS "NATAL" - they had only been married a matter of months when he was killed I have since discovered - thank you for clearing the mist about the NATAL. Clearing my late aunt's effects I have come across a photograph of 4 of her grandmother's cousins .. Campbell brothers from Huntingdon. Two are naval ratings and one has the 'Natal' hat ribbon. There were actually 5 brothers and the only one that I am certain served in the navy was Allen. The others were Arthur W., Harry G., Edgar G. and Colin J. I can't find any of them listed as a casualty of the 'Natal' disaster .. is there a list of survivors ? No Campbells on the list of survivors - he must have been serving on another ship by then. Thanks for your prompt response Estelle; a lucky transfer for him it seems. I think my Great Grandfather, George Twitty, was killed in this explosion. We used to have a big medal but I'm not sure what happened to it. As you might know as I have written about my cousin, Alfred Gunner, who died on HMS Natal - he was a stoker first class. Is there any way of getting a photo of him? We cannot find one. And back a while ago a [D Dane] was writing about the medal they got. Has he got a picture of the coloured one he could send me? I have tried to find out if copies were made but nobody knows. Thanks. Hi Estelle. I am researching my family history and am related to Thomas Frank Bebbington who died in the explosion on the Natal. I would be most grateful for any further information you may have on him as I haven't been able to find any other information on him. Louise, The only information I have on Thomas Bebbington is what is on the casualty list. He was a Boy 1st Class service no. J34477 (DEV), born 12/5/1899 in Bristol, lived at Hotwells Bristol. You might be interested in this statement from another Boy 1st Class, James Plummer, which was submitted to the court of enquiry on Jan 17th 1916 and paints a vivid picture of his experience: "I was asleep on boys' messdeck, after side main deck, and woke up coughing and saw nothing but flames and smoke. I put an oilskin round my head and made my way to the marines' hatchway, abaft galley. One of the two ladders were blown away. I went up the remaining ladder and saw Lt Fildes, who was giving orders and rigging hoses. I proceeded to the fore shelter deck and heard Lt Fildes give an order to get tables and stools from f'c's'le messdeck as the ship was listing. As ship was listing more, I hung on to a voice pipe and went with the ship, ultimately getting into the water. I then swam clear of the funnels, turned and caught a fresh hold of the ship, and climbed on to the starboard side when she heeled over, then I slid into the water again and got into Achilles' cutter where my burns were dressed; and I was transferred to Plassey next day where I now remain under treatment." Achilles was another cruiser in the squadron, Plassey was a hospital ship. Plummer, like many of the other survivors, was badly burned and had to dictate his statement as he was unable to write. My granny's brother was William Henry Poulter RN Chief Artificer on HMS Natal. He did not survive the 1915 explosion. Nell wore his HMS Natal medal until the day she died. I still have the medal. Hi, I'm William E Smyth, My Grandfather perished on board the HMS Natal in 1915, I wonder if the Royal Navy has a photograph of the entire ships crew, did that sort of thing happen in those days? I am trying to trace my Gt Gt Gradfather who served on HMS Natal does anyone have any imformation or know if a crew list exists. His name is Walter Lee, from Walton Essex. Note of interest, In my local auction tomorrow [28th Nov.09] there is a WWI war medal and death plaque to Lt. William Black who died on HMS Natal. He came from Cardiff according to Goverment website. Just today i found my grandads brother served aboard HMS Natal, i didn't even know he existed but now would like to find out how long he served. He was Mark Tippey Stoker RN Reserve, as far as i know he was killed in the explosion, would any photographs exist of the ships company or could i get hold of any paper work showing he served on this ship or any others. All the best, Derek. I've just discovered that my great uncle Henry James Parrot was serving on HMS Natal and died when it went down. He was only 20 at the time but I don't know anything else about him. It would be great if anyone has any information about what happened to him or any pictures of the crew. My wife's great uncle, Arthur Henry Small (b.1894) known as Archie, was a stoker on board HMS Natal and did not survive. We have two postcards of ship, one picture showing coal being loaded and another picture taken from the same spot of the sailors dancing. There are a further five pictures of Archie and other crew members. My Grandfather, James McDade, was serving on Natal when she blew up and sank. He told us that he went into the magazine and saw one of his mates with a cigarette he immediately went out again and was in the process of getting as far away as possible from there when the ship exploded. When we asked him why he didn't tell the enquiry this he said "They never asked me, and he was my mate. If I had said anything then his missus wouldn't have got his pension." Grandpop never embellished the story and it didn't change much in all the years I was lucky enough to have him around. He died in 1972. I have just got a postcard showing the words Greetings from H.M.S. Natal dated May 1st 1907. The words are set on a colored floral background with glittering on the flowers. If anybody would like a picture of it free of charge, kindly get in touch with me. On picture #3278 a postcard written by a J. Martin a member of the crew to a Miss Martin of Edgar Road in Cliftonville, Margate. He mentions coaling and oiling the ship at Portsmouth. My Great Grandfather Chief Mechanician Frederick Hardstone was on HMS Natal that ill-fated day in December 1915. He was in the Chief Stoker's mess at the time of the explosion. He along with the other survivors was given leave, nine months later my grandmother was born her middle name was Natal. I have my great-grandfathers medals pip squeak and wilfred and his lsgc medal. I dont however have his Natal survivors medal. i would like to get one and put it with his other medals. If anyone knows where i can get one i would be most grateful. My Wife bought me a book on cruisers for my Christmas birthday! [British Cruisers of the Victorian era by Norman Friedman] If you are a naval enthusiast I would recomend it. If not directly, you might try and borrow a copy or look in a library. Before it was wrapped up I noticed there was a large section on armoured cruisers from 1899-1906. The Warrior Class is well reprisented and there are some good photographs of Natal that I have not seen before as well as plans of the class. For those who are interested in Natal alone,the book, by its broad scope, might seem a little light.This however is understandable when dozens of other ships, of this often neglected type,are taken into account, All the best, Steve Bradley. My Granddad looked after a man called John Norris in his late 70s a long time ago, he became very close to him and when John died, he gave my granddad his medal that he received after surviving the explosion, I just wanted to know if there was a way I could find out more about John? My Grandfather survived the explosion (T Robinson) he has passed to me via my father the "Natal" commemorative medal given by the people of Natal in 1915. I have no Knowledge of a survivors medal or Badge issued and would be very interested if such objects exist, if anyone has a photo please publish on site. Samuel Edmund Butcher died in the explosion. He married my great aunt Edith Dorrington in 1911 in Plymouth. Edith never came to terms with the shock and spent many years in an institution. She died in Plymouth in 1965. Gunner Butcher is remembered on panel 5 on the memorial on Plymouth Hoe.